Last week, I was visited by two ladies who are Jehovah’s Witnesses. I always enjoy talking to Jehovah’s Witnesses, but they are just never prepared to talk with someone like me. One of the women took the lead and within 5 minutes or so, she realized she was seriously out of her depth, so she asked if she could come back with “someone smarter.” I told her she was welcome to come back. When I got back from lunch today, she walked up my driveway with another Jehovah’s Witness (a guy). HA! Well, kudos on having the balls to actually follow through. Theresa was in the kitchen and could hear us greeting one another in the driveway and, realizing that Jehovah’s Witnesses were here, she said, “Oh God… *sigh*”. She didn’t realize it, but we were able to hear it outside and I laughed. The JW lady asked if the person inside the house was upset about them showing up and I said, “Oh, no. She’s not sorry for me that you’re here, she’s sorry FOR YOU that you’re here.” heheh. It was rather hot outside, so I invited them in. Theresa welcomed them, got them glasses of ice water, etc. and was a very nice hostess. JW: You say you’re an atheist, what exactly do you believe? Me: I have not seen any evidence for the existence of any god and so I see no reason to believe in any god. I am well educated when it comes to the Bible, to history, to science and to religion in general. I’ve even read the Qu’ran. I’ve looked around sincerely and found no reason to believe in the existence of a god. Beyond that, I also do not consider the Bible to provide any good source of morality. When I consider whether or not I could use the concepts in the Bible as a basis for morality, even separate from god, I have found the answer is “no.” There are just far too many ideas in the Bible which are put forward as “moral” choices which I consider to be horrific. There are also far too many people who are put forward as good examples who are just horrible, horrible people and should never be considered an example of a good person. JW: Were you always an atheist? Me: No, I was raised as a Christian. JW: What sect of Christianity? Me: No, I was not, but I sent a letter to my old congregation to disassociate myself from the organization. Amusingly, they refused to believe that it came from me, so they didn’t accept it. I don’t tell Jehovah’s Witnesses those details unless they specifically ask. I’m not going to lie, I’m just not going to volunteer that information. The reason is because, according to Jehovah’s Witness rules, that technically makes me an “apostate” which means they really aren’t allowed to talk to me. They are given a little bit of leeway if they are preaching, but when they encounter an apostate they are supposed to leave and report to the Elders (similar to Pastors) in the congregation because only the Elders are allowed to speak to apostates. I wonder why they wouldn’t want members of Jehovah’s Witnesses speaking to people who have realized that Jehovah’s Witnesses are full of crap? It couldn’t possibly be to prevent their members from learning about the lies they are being fed? Naw… it couldn’t be that. That would be awful. When I was explaining my beliefs in my answer to his first question, I implicitly gave this guy two options for the course of our conversation. He could choose to discuss: 1) Evidence for God and/or 2) Basis for Morality. Perhaps science isn’t this guy’s strong suit and he’d rather approach the topic of morality which is less absolute and much squishier. He chose Evidence for God for the rest of the conversation. Wow, THAT was a mistake on his part. He reached for the same old Creationist arguments which I’ve run into a hundred times. They are VERY bad arguments, but if you want to believe them it is easy to ignore the gaping holes in the logic. JW: Every house was built by someone. Likewise, the Universe had to have been built by someone. *sigh* They always lead with the WORST one though. Why do they always start with the dumbest of the arguments? Me: So, EVERYTHING had to have a beginning? Nothing can exist without being created by something or someone else? Me: Then who created Jehovah? JW: Jehovah has always existed, He doesn’t have a beginning. This is the First Cause argument and it is as popular as it is broken. 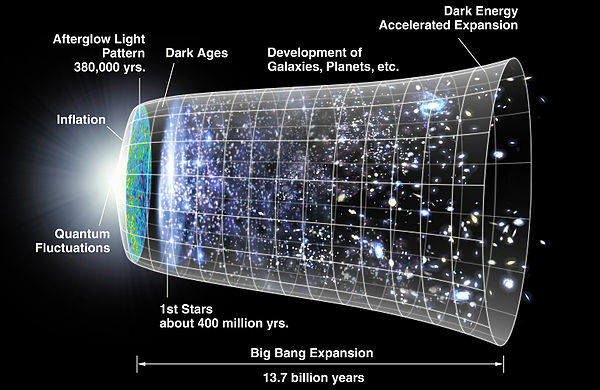 After the above response, I explained if you were going to give a special exception for “something which existed forever and had no beginning” then how about if we just apply that to the Big Bang. We look out into the Universe and we see that everything is moving away from us which implies the Universe is expanding. So, if we roll the clock back through time it gets smaller and smaller and that leads us to the idea of the Big Bang. While there are theories about how the Universe could come into existence spontaneously out of nothing, let’s just assume there always was some matter which was infinitely dense. If you want to assert an exception to your rule of everything being created, then why not just assume that matter always existed and then the Big Bang could have happened and everything that happened over the last 13.8 billion years can be explained without the need for God. (here is a longer video more fully explaining the theory from Lawrence Krauss about how Space itself could spontaneously come into existence from nothing). JW: Well, when it comes to the Big Bang Theory, your information is a little out of date because almost no one believes in the Big Bang Theory anymore. Me: WHAT?! Woah, woah, woah. What the heck are you talking about? The Big Bang Theory hasn’t been tossed aside by scientists. It is, without a doubt, the most widely accepted idea that best explains the history of the Universe. WHAT scientists are you talking about that do not agree with the Big Bang Theory? JW: There are lots of scientists, the majority of them who do not agree with the Big Bang. Me: WHICH SCIENTISTS? Do you have even a single name? Are they cosmologists and astrophysicists? JW: Well, I don’t know their names, but I know there are a lot of them. Me: NOOOOOO!! I don’t know if it’s the Society (the JW organization) that is telling you this lie, but it’s FALSE. The prevailing theory in cosmology and astrophysics is the Big Bang Theory. Do you know the name Neil deGrasse Tyson? He’s an astrophysicist who focuses on educating the public about science. I like to think of him as this generation’s Carl Sagan. He hasn’t tossed aside the Big Bang Theory. Lawrence Krauss is a leading theoretical physicist who’s primary field of work IS Big Bang Cosmology. You are being TOLD by someone that the Big Bang Theory isn’t accepted by scientists anymore, but have you talked to any ACTUAL scientists about this? If you did, you’d find out they DO agree with the Big Bang Theory. He wisely tried to change the subject after saying something so incredibly stupid and I’ll write more tomorrow about the rest of our conversation. In short, he lasted about 30 minutes before the lady said they needed to leave and convinced him to go.